Those minilite-style wheels certainly aren't factory, but damnit, I want those on mine!! It'll go great with the bronze paint. 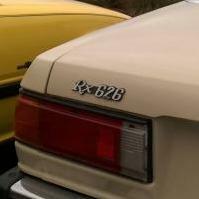 Where the DOHC badge has been stuck, is where the 626 badge should be located. No unfortunately, there were no DOHC Mazda motors available at the time. The first true DOHC motor B6 1600 came out in the 1985 BF Familia GTX and it was FWD. You US guys also missed out on the flush front because of the "standardise the headlights" rule to make them easily replaceable all over the US. Australia did not receive the front fender mirrors as these were deemed a potential hazard in frontal impacts with pedestrians. This video of the genuine S2 626 Capella sales brochure is what you should be looking at for styling cues. I would happily sacrifice my left nut to obtain the wood grain steering wheel, wood grain gear knob and wood grain centre fascia. These are true "Unicorn" options! Strange that they only put a Capella badge on the fender on the left.